Marta Conde, a PhD candidate at ICTA-UAB and coordinator of EJOLT’s work on nuclear energy, investigates social movements and resistance to resource extraction – with a special focus on uranium mining expansion in Africa. She recorded this film in September 2011. The video comes together with a report on the Radiological impact of the Rössing Rio Tinto Uranium Mine and a Study on Low-level radiation of Rio Tinto’s Rössing Uranium mine workers. Both reports will be part of a wider EJOLT report on uranium mining, published soon, on this website. As the reports and documentary show, there are reasons for concern. Workers at the mines are dying of illnesses they don’t understand, the water of the Khan River is being polluted in this arid country and the tourism sector could be put in jeopardy if the uranium mining expansion goes ahead. At present, there is not a structured social protest in Namibia regarding the uranium mining expansion with some communities welcoming the mines as they hope for jobs and ‘development’. Several workers from Rössing-Rio Tinto mine have complained about their illnesses and the Toopnar community is worried but the current chief is willing to talk to the mines, trying to bargain as much as possible for its people. The only active challenge to the mines is carried out by Earthlife Namibia and LaRRI, two local NGOs, who voiced some concerns during a 2008 campaign and now again through the EJOLT project reports. Credits go to Nancy Arizpe for two years of careful editing and producing, to CRIIRAD for all the measurements and to Earthlife Namibia and LaRRI for raising the issue. Conde, M., & Kallis, G. (2012). The global uranium rush and its Africa frontier. Effects, reactions and social movements in Namibia. Global Environmental Change, 22(3), 596-610. The situation in Namibia presently has changed a little since the movie was recorded. The price of uranium has dropped down significantly making several mines with low uranium concentration not viable. Only the Husab project next to Rössing, which now has Chinese capital, seems to be going ahead. Areva also stopped its uranium mine Trekkopje. The mine had already undergone a pilot plant and had constructed a water desalination plant and the pipe to the mine. It remains to be seen what Areva will do with this infrastructure. Will it be left there to rust in the middle of the desert as predicted by John Pallett in the documentary? 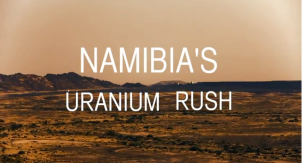 It would seem then that the best hope for Namibia to stop the uranium rush has not so much been its social resistance but the price of uranium.